I've gone back to metal bait screws. So quick and easy and can't recall one coming off. Good tips there mate what make of beads do you use and what size swivels mate ? I always put foam around it anyway unless dropping it on a fish's nose. Doesn't move at all. Only time I have had the bead move is after playing a fish! is there no nagging doubt it might come off giving it the big un ? Is it the soft nature of the beads that enables you todo this ? Just asking as yet to try it ! Some of the the other beads being more rigid ? I agree that's a decent idea. quicker, and easier to do when you have the just-landed-a-biggun shakes too. Each to their own but that seems a bit extreme. Saves 20 seconds max to tie on a bait?! Not in the dark it doesn't. Takes me less than 20 seconds to change from one bait to a completely different bait without having to faff around looking for lighter, needles, floss, etc. Even in the day time I can reel the rod in, take fresh bait out of pocket, take old swivel & bait off, put new bait back on & back out again without even thinking about it. Even better when stalking & don't want to be moving backwards & forwards to rebait etc. Try it and see before knocking it. My missus KNOWS I'm a sad case. She loves me all the same though. Why would you remove the swivel to replace the bait ? Don’t you tie it on ? Another thumbs up for shrink tube. Tried the ESP grip stops and they're spot on. Thanks for input. Found the Gardner ones would slip and started to glue them from the off however I’ve been using the ESP for the last year or so and they haven’t budged. I've just got some today and seem great...nice and small. Just use a pair of scissors, just cut along the shank of the hook and through the bead at the same time. Also use it to remove tubing and shrink tubing off hook shanks to. Its easiest and quickest way I have found when I am scrapping and salvaging bits from rigs. Main reason I started doing it is because I couldn't find my hook beads when on the bank fishing, and shrink tube just seemed right. 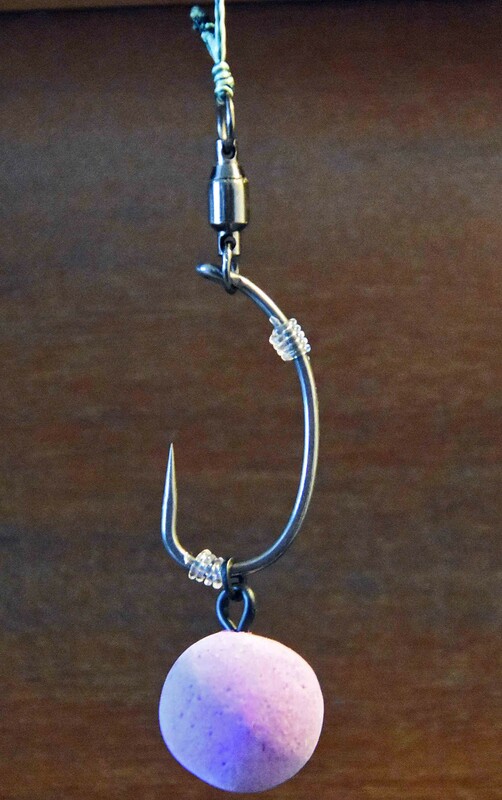 The annoyance of pulling hookbeads off the hook when scrapping a rig to get to the ring or ring swivel back just seemed to grate on me, and shrink tube seemed less money in the bin. I've been using the Thinking Anglers ones recently and they haven't slipped/moved yet. I thought they looked a bit small at first but they are spot on. I have been using some Taska Tungsten ones the last few years, I find the coarser and harder nature of the Tungsten seems to grip the shank better than standard plastic ones. I also have some other green ones which are good too, can't remember the make, might be Gardner. Thanks for the clarification. So many little tips and tricks to learn in this sport! I had quite a few slip on big casts hence why I moved over to bank tackle ones. Gardner ones do not either. They have a shape which actually means its harder for the stop to move, it would rather fold up on it's self. I've used those a lot and they are excellent, never had one slip. They are Domhoff Knots (aka a whipping knot) tied using 30lb fluorocarbon line..
ESP Grip Stops, absolutely don’t move! Sorry for my ignorance but is that a stop knot? If so, what material are you using Ken? Cheers gents think I'll try either line or powergum whipped to the shank. If you struggle to find any that stay put, a couple of whipped power gum stops hold extremely well. All the ones that I have used have slipped eventually so I started using a piece of tight fitting rig tube and superglue it in place or just superglue the rig bead in place when it starts slipping. Just got some from deception tackle seem to grip really well. Haven't had any slip yet.